Liberty Tower, 1910, Irving Underhill, Prints and Photographs Division, Library of Congress. 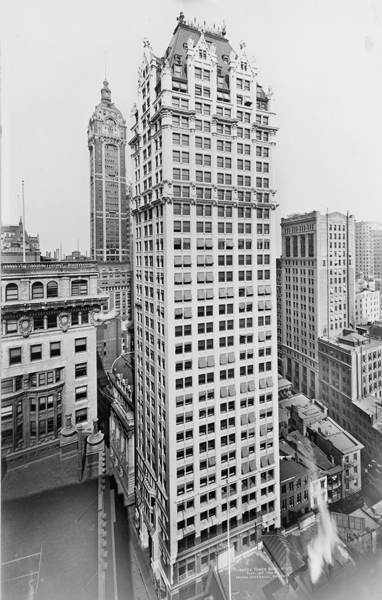 Although developed by a group of real estate investors from St. Louis and designed by a Chicago architect, Henry Ives Cobb, Liberty Tower was a quintessentially New York-type skyscraper. Like the Bankers Trust, it was shoehorned onto a small corner site, just 58 by 82 feet, on Liberty and Nassau streets, three blocks north of Wall Street. Rising 33 stories, 385 feet, it was, according to the developer's promotional brochure, "the tallest building in the world on so small an area of ground." The building rears its lofty height from the chasm-like reach of Liberty Street and seems to more than ever narrow that thoroughfare, despite its clean white walls and the brilliancy of its terra cotta finish. This terra cotta was supplied by the Atlantic Terra Cotta Company. Besides the terra cotta, much white, dull-finished porcelain brick was supplied by the Sayre and Fisher Company which with their impervious surface are equally dirt resisting with the terra cotta and would seem much superior to white marble for such a structure. The lightness of the façade was also conveyed by the large paired windows-larger and more closely spaced than was common in New York buildings-which made the wall seem thin and relatively weightless. Cobb's design may owe more to Chicago School models such as the Reliance or Fisher Buildings than to West Street or the Times Tower with their emphasis on the visual weight of the wall. The well known 1912 photograph of Liberty Tower by the Alvin Langdon Coburn, titled "The House of a Thousand Windows" communicated his fascination with the modernity within the medieval model. NEXT: "How Tall is the Woolworth Building"